The World Evangelical Alliance (WEA) inaugurated its new Secretary General Bishop Efraim Tendero at its International Leadership Forum (ILF) in Tegucigalpa, Honduras. 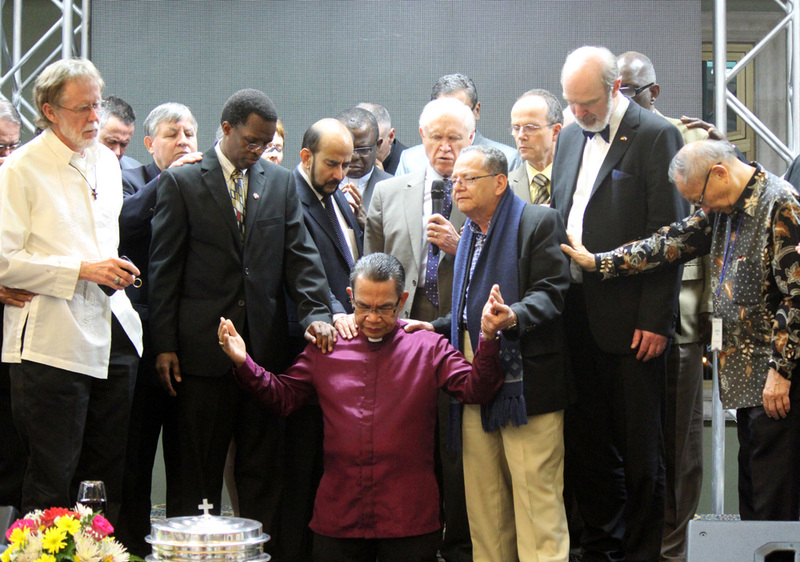 Evangelical leaders from over 40 different countries from every region prayed for Tendero and welcomed him as the new leader of the WEA, representing 600 million evangelicals worldwide. The ILF, held from February 9-13, is WEA’s annual forum that brought together more than 70 leaders from the International Council, the Executive Team, representatives from the various Commissions, Initiatives and Task Forces, Regional and National Evangelical Alliance leaders and Global Partners. It was the first time that an ILF was hosted in Latin America, made possible by the gracious support of the Confraternidad Evangélica de Honduras and the Alianza Evangélica Latina. “As we commissioned our brother Efraim, I was reminded of the words of the apostle Paul to the Ephesian leaders. Not knowing what was ahead of him when he lands in Jerusalem, his commitment to the ministry of the gospel was unswerving, ‘to finish the race and complete the task the Lord has given me’, that is what informed my prayer for him,” said Rev. Ndaba Mazabane, Chair of the International Council and acting Secretary General. “I have been amazed by the tremendous goodwill and support Bishop Ef has received from our constituency and this gives me hope and affirms our decision to have appointed him. The task ahead is huge, but together with God’s help we will strive to build unity among evangelicals and promote the gospel of grace globally,” he added. Bishop Tendero whose tenure will officially start at the beginning of next month, participated in the ILF engaging with leaders from the WEA constituency. He presented his vision of equipping the churches around the world to effectively advance the Gospel of Jesus, seeking holiness, justice and renewal at every level of society: individual, family, community and culture. Preceding the ILF, the global and regional leaders of the WEA met from February 6-9 to explore how to work together in new ways to more effectively serve their grassroots church constituency in 129 National Evangelical Alliances. The facilitated conversation focused on the respective roles of global and regional leadership in their shared 21st century context. For a selection of hi-res photos, click here.